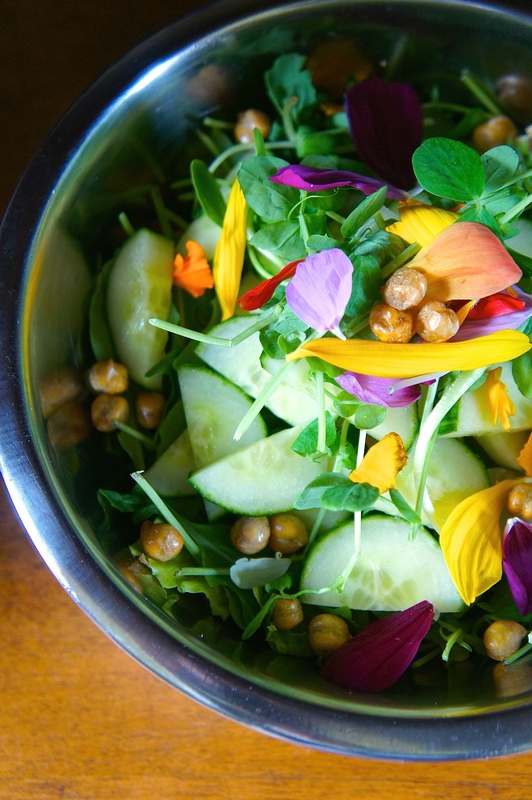 This colourful and delicious salad is both incredibly healthy for you and beautiful to look at! With a delicious combinations of flavours and textures, this makes for a perfect and fresh summer salad. There are chickpeas added to this salad for a pop of protein and crunch, amongst the vegetables, and all of the ingredients are organic and raw. So fresh, light and 100% guilt free! Put your desired quantity of spinach, arugula and sprouts into a bowl. Chop up your cucumber and red pepper and place on top of the greens. Sprinkle the flower petals and roasted chickpeas on top.